There are numerous journaling Bibles available with the Protestant Canon, however only the out-of-print Oxford NRSV w/apocrypha was ever close enough for a Catholic to like and use. 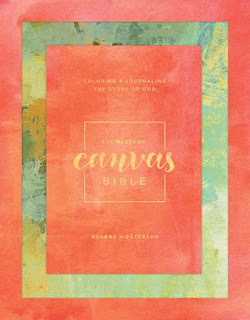 Yet, I think there is a market for journaling/canvas bibles for Catholics. This one, from Tyndale, utilizes The Message translation, which if there ever was a perfect bible for journaling or doodling, this would be it. So, who in the Catholic publishing world will take a chance to create an actual journaling bible in a Catholic edition? Which translation would work best? * Make this Bible one of a kind by adding your own beauty and style. * Fill the extra space with your own illustrations and prayers. * Immerse yourself in the words of Scripture. * Decorate this Bible as a gift for someone you love. * Slow down as you color and enjoy a more relaxed pace. I think that this fits into the pattern of many Catholic Bible publishers not taking the kind of time and attention to detail and presentation that publishers of Protestant Bibles accord their work. We still don't see high-quality leather editions of very many Catholic editions of the Bible, the kind of Bibles that can last a lifetime (or more) of heavy use. We see cheaply bound paperbacks, hardbacks and "bonded leather" Bibles that with careful use might last a few years. Same with the variety of layouts -- we don't see the kind of innovation that Protestant Bible printers employ to provide Bibles for a variety of uses (like note-taking or personalizing). Sad! I'm not a fan of genuine leather for the sake of genuine leather -- I'm a fan of sacred books being able to last more that a year or two. I have a copy of the Didache Bible (NABRE edition) that I got a year ago. Hardback. Already, the spine of the Bible has a tear at the top. I keep this Bible in a Bible case, and treat it with great care. And that tear just keeps getting bigger. The cover is going to be split by another year. What will I do then? Ship it off to Leonard's???? Genuine leather lasts. That is its virtue. Leather from cows (including calfs) and pigs is generally a byproduct of the meat industry. Probably the same is true even for more uncommon leather, like goat, though probably not for truly exotic leathers. Anyway, unless you are a vegetarian you really have no special ethical reasons to avoid leather covers. These cows are being killed to supply your burgers and steak, and not to forget your gelatine, anyhow. I would even say that it is more moral to make good use of all the parts of the animals you kill than let anything go to waste. Concerning this particular blog post: I did not see the inside of that "colouring" bible at your link. That makes it all kind of pointless, i.e., I cannot judge how bad I should feel about having no Catholic version of this if I cannot see what exactly this is in the first place. The leather covers comments was just a joke, I don't have a problem with them except for the cost. I agree with you DD to a degree. However, if you look at the quality of bibles made by Catholic publishers in 40s and 50s, notably in the Douay and Knox editions, they were truly treasures. They were well made, in leather and beautiful. So it has been done! "Some might think me fanatical, but the bible itself is not paper and ink to me but the very breath of God. I carry my bible everywhere, but have never put another book on top of it. I won't even lay a piece of paper on top of it." No wonder Protestant Bibles are so impressive given they serve as substitutes for sacraments. Without the Real Presence you'll make a book a real presence. Composed of body and soul, it shows how we are hardwired for sacraments. I feel the same way, though. I won't lay a Bible on the floor, or place any book on top of it. I find the very notion of a journalling Bible to be Narcissistic and sacreligious. Probably the best secular analogy is a "journaling" art gallery, where visitors can leave remarks and signatures on the world's greatest art treasures and historical artifacts. "I won't lay a Bible on the floor, or place any book on top of it." Adhering to such a rigid standard becomes more and more difficult the more Bibles you own. I personally own more Bibles than I can count, including 2 copies of the 1991 NAB, 4 copies of the NABRE, 3 different copies of the RSV (including a first edition copy from 1952), two copies of the NRSV, two copies of the NIV, and one copy each of the HCSB, the NAB, JB Phillips New Testament, the GNT Ecumenical Edition, the Jerusalem Bible, the New Jerusalem Bible, REB, the 1985 edition of the JPS Tanakh and three copies of the ESV. And those are just the ones that I can remember off the top of my head. I'm sure I have more. A rule that a Bible can't be on the floor and no other book can be set on top of one, would make it very difficult for me to store them. I'm with Christopher. The whole Bible gimmick deal is a bit strange to me. Yes, and perhaps a bit narcisistic, but isn't that where our culture is today? Not too surprising. And Timothy's right, as well: though Dcn Dave makes a good point about all the other gifts we enjoy as Catholics, Bibles--- and even missals and other devotionals--- used to be made with great attention to detail and quality (I have a few old Bibles, missals, and devotionals, and they're covered with genuine leather, and have sewn signatures, which will last longer than I will). The Bible deserves to be treated as a sacred object; and practically, it should be made to last. As for Biblical Catholic, I'm just REALLY impressed he came clean with his Bible count. I am still in denial about my collection: Oh, I have just a few... so embarrassing. I picked one, and sold the rest. I simply am not familiar with the idea of journaling Bibles. It is not something people did during my childhood and it feels foreign. Jerry, it is a fairy new phenomenon, perhaps over the past 15 years. It was often used by teachers so that they could have large margins to place notes on. Later, people began to use the margins for artistic works. There are whole groups on social media of varying sizes that promote and share images and sketches that people have done in their bibles. "I'm just REALLY impressed he came clean with his Bible count." Since I posted that, it occurred to me that I left a few out. I also own the Knox Bible, a copy of the KJV, Challoner Douay Rheims, the Geneva Bible and the New Living Translation. I have started to draw in my bible. While I'm reading if I get a picture in my mind I try to draw it on the page. I actually draw it over the words in pale sheer colored pencil so the words are visible through the color. The Word remains the important part and the picture puts focus on it. I thought this would be the bible to pass down to my grandchildren. Susan, well said, and very good point! As an illustrator, I should get that. What a gift your Bible will be for your children and grandchildren one day. I own my grandfather's KJV Bible (he was Presbyterian), and am grateful he underlined favorite passages. I never knew him, as he died at 41, so it helps me see what really mattered to him. It gives me a window into his spiritual life, I suppose. What a gift! What I do find strange is the proliferation of Bibles out there on the Protestant market. I actually saw "The Puppy Bible" recently. No joke. A Dad's or Mother's Bible, with devotional sidebars focused on a particular topic makes some sense to me. But a PUPPY Bible? And some of the cover designs out there seem to pander to the contemporary "everything has to be eye-candy, entertain me" approach. Just saying. This idea just came to me upon further reflection about Catholics and dearth of Bible editions. We Catholics DO have this same kind of marketing attitude and clientele but it is not for Bibles. It's for the rosary (which perhaps we can think of as our Bible-in-prayer-form). And I would venture to say that the rosary is to the average practicing/cultural Catholic what the Bible is to many a Protestant: a treasured religious item that symbolizes one's spiritual connection with God and religion....even if it is never prayed but only held or simply displayed in a box just as there are most likely many a Bible getting dusty on Protestant bookshelves. Off topic but how do I get email update on your posts since the feed link (atom) doesn't work? When I get a spare minute, I will work on alleviating that problem. Why OUP stopped producing this I do not know. I just found some Catholic Coloring Devotional books. Basically, these are separate booklets of books from the Bible with wide margins. They seem to be fairly recent since I saw one of the latest booklets published just this month! I think we could learn a lot from our fellow "people of the book." Can you imagine any religious Jews embracing a journaling Tanakh? Any Muslims warmly welcoming a coloring Koran? If I regard our scriptures with even half the reverence of our sister faiths, you can perhaps understand my raised eyebrow here. By the way, I found the Catholic Journaling Bible: New Testament, Psalms & Proverbs. It uses the Catholic Public Domain Version (CPDV) translation, which would probably explain why anybody took the risk.